COPS regional age group squad. From the left they are, back, Connor Walker, Brenna Howell, Holly Graves, Ella McGhie, Harriet Salisbury, Matthew Newson, middle, Jessica Mahoney, Kiara Kovacs, Sophie Griffin, Lauren Browne, Amy Paget, Eve Wright, front, James Rothwell, Bert Papworth, Joshua Spencer, Fabian Brudnicki, George Whiteman, Erivan Shilani. Missing from the picture is Hannah Daley. 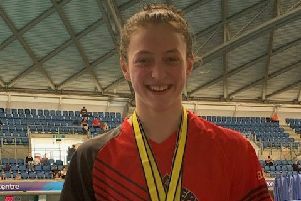 While not achieving medals George Whiteman, Hannah Daly, Jessica Mahoney and Fabian Brudnicki swam strong personal bests across the weekend. Club head coach Ben Negus said: “I am delighted with the determination and grit our age group swimmers displayed in Norwich. At this stage in their career attention to technical ability is paramount and going out and delivering their best in the most determined way possible is what we are looking for and I am proud that this squad did just that. They stepped up and swam hard and fast and showed their regional peers that they are strong competitors. “Through racing against the best in the region they have without doubt developed and improved their race skills and competitive mindset. 13 Yrs 100m Backstroke: 7. Ella McGhie 1:12.34 . 14 Yrs 100m Backstroke: 4. Eve Wright 1:09.96 . 13 Yrs 400m IM: 2. Brenna Howell 5:35.20; 5. Ella McGhie 5:37.66;. 13 Yrs 200m Butterfly: 2. Connor Walker 2:26.30 . 13 Yrs 200m Backstroke: 8. Fabian Brudnick 2:39.45 .